The houses of the Georgian era were either row houses or they were freehold. They were characterized with the comprehensive interiors, awesome symmetry and highly decorated embellishments which included egg and dart motifs, sheathing, details of tassel and scroll. The lighting countenance of the Georgian Era was very strong, had symmetrical fixtures that depicted decorations like scrolls, shields, wreath, acanthus leaves, and urns. Most of the lightning was composed either of silver or brass which featured polishing and glazy brass finishing. Candles and hurricane shades were mostly used for the ceiling lightings and wall scones of the Georgian era. What was Used for Lightning in Georgian Era? Georgian people used candles, lanterns, and rush-light as a principle means for lightning their homes. With some improvisation, they also started to use chandeliers, oil lamps, and early gas lighting by the end of the 18th century. Wax candles were very expensive and usually, they were made of beeswax. They could be left unattended for a longer time. Only rich people could afford these candles and they used it to show their superiority over others. The reason for wax candles being costly was that they were being taxed and also because of the material used. However, they had a disadvantage that they use to melt very fast than other sources. These candles were mostly used in chandeliers as they were self-burning and hence don’t need any servant to blow them out. 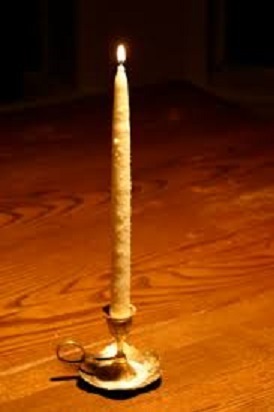 As wax candles were not economically affordable to all, poor people found another alternative which is to use a rushlight. It is very cheap and also easy to make. They were made by dipping rush or thin chips of wood into the grease. They were cut freshly and then greased into the mutton grease or any other animal fat which makes it easy to peel off their outer skin. The wood was pinched between the metal pliers for holding rushlight. As soon as the rush touches the pincher, the light will blow out. The rushlight does not burn for a long time and hence it needs to be burned again. Tallow candles were mostly used by servants and middle-class families. Instead of using wax, these candles were made from fat. The source of fat could be like from sheep or cows and hence they were much cheaper than wax candles. First, a cotton linen lining was dipped into the fat and then they solidified. To have the desired size the candles have to be dipped many times. However, they do not burn for a long time and also offers very poor lighting. Although tallow candle is tax-free as the material is to be purchased for it, it leads to very minimal tax and so affordable. Tallow Candles and rushlights are made of fat and hence they stink a lot while burning. Different methods like soaking the wick in the vinegar and burning the pastilles of gunpowder were adopted to hide the bad odor. They cannot be used for a longer time as they have to be trimmed periodically. Chandeliers are the branched lights that are usually mounted on walls or ceilings. Initially, crystal chandeliers were mostly made of metal frames surrounding by the crystal but when glass technique was introduced in 1720, glass chandeliers were developed then. The initially crafted chandeliers had the candle holders with short arms with the drip pan and arm being welded into one unit. They were usually mounted in the important rooms and were designed in such a manner to light those rooms in most extravagance way. In larger houses, wall scones and hall lights were also used other than chandeliers. Scones were basically the wall fitting that had a mirror behind them to reflect light and were used mostly on the chimney breast. Hall lights were either wall fittings or pendants that included candles protected in a glass case. The oil lamp in its traditional form needs only wick, fire, and liquid oil. For further improvement glass chimneys were kept around it to keep the flame steady and also protects it from getting blown away. However, they smoked very badly and the odor was much more worse than that of tallow candles.